Even though the girls' house collapses and dolls are old and old, and girls play not only in sports like cricket, hockey, football, and athletics, but they seem to be a fascinating success. However, there are still many games that are called by people, people only think of boys' asses. This is a game of video gaming. But Islamabad resident Saadi Bashir not only adopted this hobby but also started making video games with new style and ideology. Saddi Bukhari's curiosity, when she went to childhood with her brothers, went to play the video games when she played the same game on a co-computer. In the curiosity of knowing about this modern machine, they opposed parents and left their school because there was no computer education. Parents decided to look after them in their passionate and in-depth study. After college too good results, they decided to graduate in the same article, so they realized that their financial conditions could not afford it. Saddi said, "It was a very difficult decision for me because no girl had gone to my family before me." In addition, due to financial circumstances people in our community invest on boys' education rather than girls. In such a way, the educational institution convinced them to give the opportunity to get a scholarships. Saadi obtained his scholarships from the Higher Education Commission and completed the graduation. During the course, I was greatly influenced by Computer Graphics. I started making video games from here. My final air project was also a game in which cancer patients find out the cancerous cells found in their body. It was a plan that stimulated cancer patients to fight their illness. 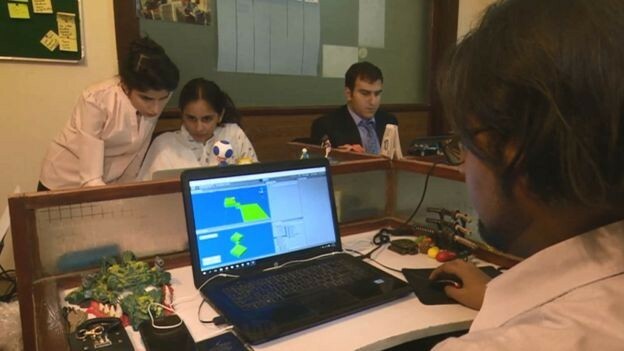 Because of the absence of an institutional instructor for making video games in Pakistan, Saadi did various jobs in the video game industry for a long and a half year but she felt that she could not do what she wanted to do. 'I realized how my dream is to learn how to make my games. That's why I started my master's thesis. And tried to know what mistakes are made to make video games and what are the things useful. After completing his education, Saadi realized that whatever he learned from education and research, it is not necessary for many youth to learn from this field all the time. So they abandoned their job and started an institution named 'Pixel Art Academy' where they train youngsters to make video games. "There is no game design element in sports industry in Pakistan." People have great ideas but how to put them in good games is not a skill. This is what we teach our students. Making games is not the work of a special education or a skill. We tell you that this can do anything. Whatever your education may be, even a school student or a housewife can make games. Saeedi is also trying to promote video gameplay with international forums. 'One of our Hackney Games' game Impact James is in which we make games that are about some social issue and suggest solutions. Last year, we made games on water pollution. Saeedi believes that through the video games industry, we can introduce civilization, art, music and values ​​to Pakistan in the world.